This rustic wooden box sign - with its old-school, stencil-style lettering, stylishly faded paint and realistic weathering - looks fantastic on any wall, desk, shelf or practically anywhere you place it, and, best of all, it expresses an amusing, eye-catching message. 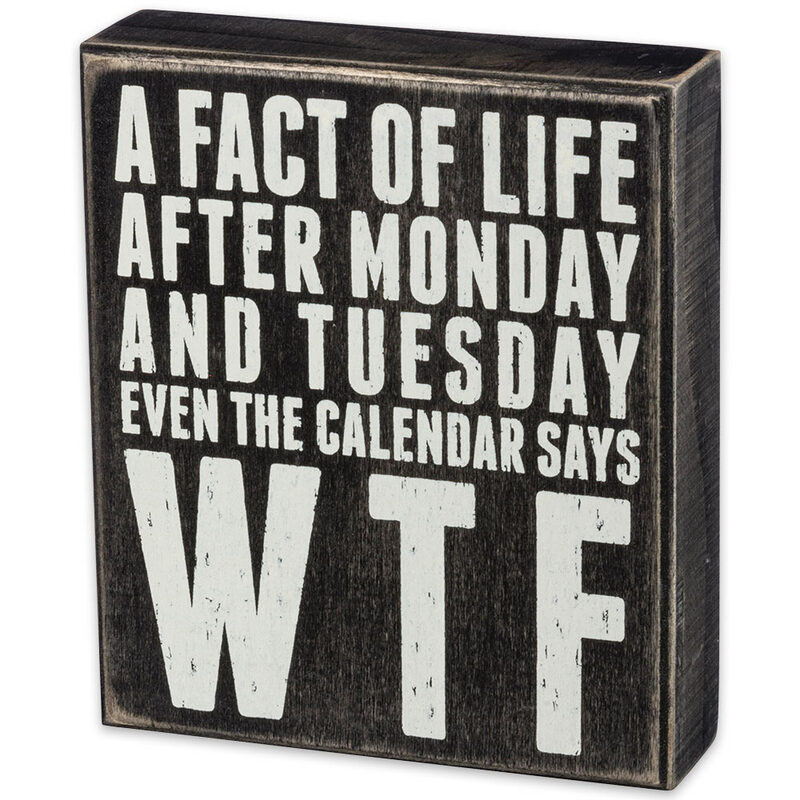 “A Fact Of Life: After Monday And Tuesday Even The Calendar Says WTF!” it reads. What a hilarious universal truth! The off-white, distressed stencil letters are emblazoned on a background of tastefully faded black. At 6” long x 7” high, there’s really no wrong place to set or hang this handsome piece of vintage-style décor. It livens and adds a touch of humor and traditional rural grace to any office, living room, bedroom, kitchen, dining room, den, garage, barn – the list goes on. Get two – one for your own home, one to gift to a friend. It’s a funny present sure to be remembered! Thankfully, it’s easy and painless to get as many as you want with our unbeatable prices! You’re sure to chuckle every time you glance at this funny-yet-stately Rustic Wooden Box Sign.